IT WAS the worst in 151 years. Carlton last night succumbed to the biggest defeat in its long history, lying down in an extraordinary humiliation at the hands of Hawthorn. The Blues lost 4.11 (35) to 27.11 (173) in a 138-point defeat that puts a massive dent in John Barker’s long-term coaching aspirations. After Carlton’s lowest ever score against the Hawks, it will almost certainly be a fatal one. Across town at the MCG, 99,000 fans watched Real Madrid score as many goals as the Blues in what was another Friday night horror show for the AFL. If all that wasn’t galling enough, the Blues’ worst loss was witnessed by one of its best ever sides, with the 1995 premiership side gathering as part of their 20-year reunion. Words just don’t do justice to how easily Hawthorn won this game. They ran through a banner that read: “Tonight we feast”, but they could never have imagined how monstrous that feast would become. The premier amassed 116 more disposals and 33 more inside 50s. But the fact they amassed 78 more uncontested possessions highlights how comfortably the Hawks moved the ball down field. 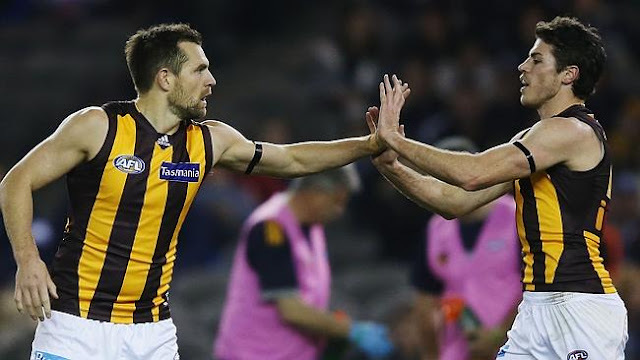 The Hawks monopolised possession at a staggering 79 per cent kicking efficiency — some 13 per cent above average — and didn’t just have one option, but often had two and even three with ball in hand. The Blues’ pressure was not only non-existent, but they conceded a whopping 20 goals directly from their own turnovers. When they did cough it up they watched on with those outside the fence as the brown and gold machine marched down field. The half-time margin was 65 points. Skipper Marc Murphy tried his guts out all night and Matthew Kreuzer had eight of his side’s 16 clearances at half-time. A bloke in the men’s room turned to his mate and said: “It’s like the Harlem Globetrotters playing against themselves”. A Hawthorn side that has embarrassed Fremantle and Sydney in the previous two weeks, again showed a lack of hunger is far from an issue. They pressed hard and for long periods Carlton just couldn’t get the ball out of its defensive 50. For Carlton, the only thing as frightening as this smashing is the fact this side plays Hawthorn again in six weeks.